When The Chevra’s other albums were released, I was not exactly into Jewish music. 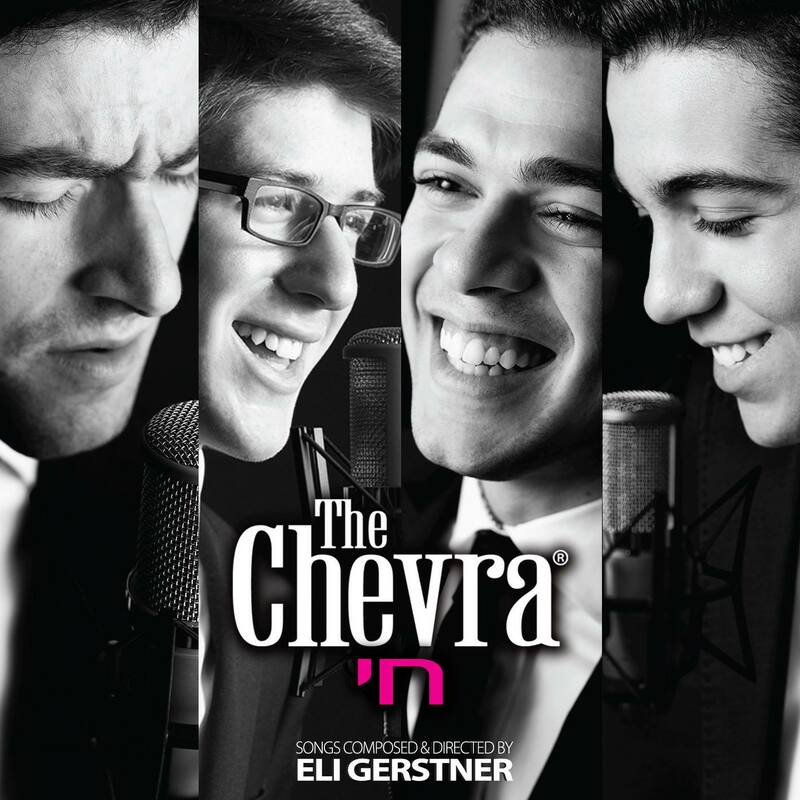 I’ve heard a lot their songs, but I don’t own any other Chevra albums. (Just feel like a disclaimer is appropriate). I didn’t know what to expect with this album except the high-energy Eli Gerstner hits, which yes, it has. In short, this is yet another EG homerun, which all his albums seem to be, and despite having a (mostly) new group of guys—Nati Chaboura, Ely Shalom, Elimelch Sperling, and Azriel Zylberberg– , retained the same basic sound. If it ain’t broke, why fix it? So if you’re a fan of Eli Gerstner in general or the Chevra’s older CDs, it would be surprising if you didn’t enjoy this album. The album starts out, like most, with a lot of intensity. For me, this song is a bit too techno-ey. There are sometimes long techno interludes that I think the song would do better without and I feel that a more simple song would better show off their voices for a title track. Still, the song is extremely catchy, upbeat, and fun, and definitely a hit. The first slow song on the album is a beautiful one. I’ve said before that Eli Gerstner is a pro at fast songs, while his slow songs are just pretty good. Lately, though, I think his slow songs are getting really great as well. This is a good example of that. The lyrics are from Eichah, and it has an uplifting feel. Gorgeous! I also appreciate that unlike a lot of ballads these days, its not full of intense guitar riffs (though it does have a little sprinkled in there…). I never got that. This is a fun sing-along English song about having Jewish pride amongst other things. I have listened to it many times and enjoy it, but I think its more for the kids in the family since it’s a bit cheesy. Still you will find yourself rocking out to it in the car even if your kids aren’t with you! The Chevra doesn’t make an appearance here until after the 3:00 mark. Instead, we get the gorgeous voice of child soloist Yitzy Waldman. I am of the opinion that almost every album could benefit from a good child soloist, and this one is no exception. This track is very heartfelt and sung perfectly by all. Like Nachpisa, another beautiful slow song. I’m going to have to agree with SPLASHNEWS that this song is very reminiscent of Es Panecha for some reason. It’s an upbeat medium-tempo song featuring Yaakov Mordechai Gerstner. That’s right, he may no longer be in YBC, but thankfully he’s not done. This is not amongst my favorite songs on the album. I think it’s too intense for the tempo and I kept expecting the music to pick up. Still a good song. This is gentle, pretty song with familiar lyrics. It does pick up at times, but overall is a light laid back song. It’s a good sing along and solid song in general. The Chevra’s voices are also showed off well here. Back to dancing! This is a super fun Sephardi-techno-style song that I’ve found myself listening to a lot. Despite its simplicity (or because of it), it’s extremely catchy! I love it and can’t get enough of it. I wish it were longer… just my luck my favorite songs tend to be amongst the shortest. Another English song, this one slow and pretty. It is more serious and heartfelt. I like English songs because they are much less repetitive and this is a great example of that. It brings a great message of hoping for peace. My favorite part is when the Hebrew mixes in around 3:05. Beautiful singing here. Love it! Let’s be honest, this is really a YBC song featuring The Chevra and Benny Friedman. This video was our first glimpse of the new Chevra. I’m glad it was on this album anyway because I’ve been wanting it on my iPod and thought I’d have to wait for the next YBC album. It has a great mix of solos, fun harmonies, and changes up the tempo a lot. The Chevra actually comes in around 2:20 behind Benny Friedman and star for a brief time starting at 3:40 and again at 3:05. It’s great to hear all these stars come together and this is an excellent song overall. I think it will go down amongst the E.G. hits! Wow, an Eli Gerstner greatest hits album would be great, imagine the mix… Just saying! -I was listing my favorite songs , but it was 5/10 of the songs, so I think that’s not allowed. Anyway they were Uv’chein, Nachpisa, Kee Tov Zarmah, Mee Kell Kamocha, and Ad Olam… I think that’s a good sign! -Great driving music! Especially early in the morning. Nice review! Just like that “Mee Kel” is one of your favorite songs. I knew people would disagree with me.